After Madeline died we had to make the hard decision about what to do with her remains. It’s something that Mike and I hadn’t even really considered for ourselves, and there we were having to make that decision for our baby. I wanted my baby with ME, and the only options were awful. I didn’t want to think about the body that had grown inside me underground or turned to ash. But not even 24 hours after she’d passed, Mike and I had to have the worst discussion ever about our baby’s body. First we talked about burial. Picking a place for her to be buried wasn’t hard. My grandmother is buried in a beautiful cemetery not far from where I grew up, and I would have wanted her to be buried with my grandma. It was a small comfort to think they would rest together. But the idea of her decomposing was too much for me. Next we talked about cremation. My grandma was cremated, as was Mike’s grandfather, so it wasn’t a foreign concept. But the merest mention of it made me feel sick to my stomach. The whole process was not something I wanted to think about in relation to my baby. Making this decision for our child when we were in the depths of shock and despair was agonizing. In the end we decided on cremation, for a few reasons. When we considered burying her, I had a mental image of walking through the funeral home to pick out a teeny tiny casket. For some reason, this seemed so much worse than picking out an urn. I didn’t want her in something small, and buying a full-sized coffin seemed ridiculous. Instead, we were able to find a beautiful, regular-sized urn that fit her personality perfectly. After we’d picked out her urn, the funeral director asked us if we wanted her interred. I asked what would happen if we weren’t sure – would they hold onto her remains? No, we were told. We could bring her home with us, and if we decided we wanted to inter her we could make the arrangements at a later date. Mike and I knew instantly that was what we wanted – needed – at that point. We needed her home with us. Bringing her home with us solved my other problem – visiting her. The idea of visiting my daughter sounded preposterous. And when I thought about it a little more, I knew I couldn’t live with her being somewhere other than with me. If she was in a cemetery, I would feel a pull to visit her every day, a pull that I logically knew I couldn’t possibly honor. And I knew if I didn’t visit her, I would have horrible feelings of guilt. And what if we had to move far away? I would never be able to leave her. So that is why Madeline rests in a beautiful purple-speckled urn, in our bedroom. When we move, she will move with us. The knowledge that we can bring her along, in spirit and in real life, will give us the peace we need to leave the only home she ever knew. I am glad that you will be able to take Madeline with you to the new house. What a comfort that must be. Love…..nothing but Love & Frienship to you all!!! So happy you will all move together…just like it was always suppose to be!!!! I was just thinking about this today, wondering how you were doing. I truly appreciate you vocalizing your thoughts. It isn’t how it was supposed to be, not even close..but I’m glad that you have the comfort of knowing Madeline will go where you go. You made the right choice for you and for your heart. I would do the very same exact thing. Just some hugs, because I have some idea of how hard moving away from your home with Maddie will be. Every single bit of your decision makes absolute perfect sense, Heather. I think that I would feel the very same way,,,,,,,,,,hugs to you, sweetheart. Glad Maddie is with you every day, just as your readers’ hearts are with her and with you. I bet she’d love the new house, it’s lovely. As eerie as this may sound, my daughter has a purple speckled urn, too. Also, (following my last comment), my husband and I decided to get the jewelry that can hold ashes. I got a beautiful diamond and amethyst bracelet and my husband got a necklace with an amethyst at the bottom. We lost our daughter when I was about 5 months pregnant. At the hospital we received many options as ‘what to do’ and though cremation was always against my religious believes, we took that option. My husband made a beautiful wooden box where her little urn is, and whenever we move she will move with us too. I was thinking about y’all. It seems like there would be a lot of mixed emotions about leaving the home where you lived when Maddie and Annie were born and moving to a new home. The excitement of the beautiful new home is mixed with the memories of the old home. I wish it weren’t this way but I am glad that Maddie will move with you. I don’t know who picked out Gabriel’s casket. It was heart-breakingly small. Much, much too small. We only visit once or twice a year, more to honor the site (he is buried near several of my husband’s relatives). He is with us always, anyway. Sometimes, when my 5-month-old boy is looking at something over my shoulder (probably just the lights), I imagine that he can see his “big” brother smiling at him. Thoughts are with you, Heather & Mike. Good luck in your new home. Although I’m deeply sorry you’ve had to deal with this, I appreciate the insight you’ve given into your choice. That really helps to bring a different perspective to cremation for me. Oh, Heather. I can’t imagine what it must have been like to go through that. I’m glad, though, that Maddie will be in your new home too. I think it will help the house feel more like Home. We made the same decision for our Connor. I couldn’t imagine not having him with me. I was actually surprised how quickly I decided on cremation– it wasn’t something I had ever considered, but the day he died it seemed so right. What needed to be done. So he stays inside a little heart-shaped box (urn? I never know what to call it) that lays beside our bed. It’s small enough that it often accompanies us on trips and holidays. It’s not much, but it’s all we have. I, also, had to make the same heart wrenching decision almost 5 years ago. We made our decision for the same exact reasons you did! I feel Adam is there with us everyday, and will be forever, wherever we choose to make our home. My heart cries for you everyday, as I know there is no worse pain. My other children are what get me through, as I know Annie does for you. She is absolutely adorable!! Maddie is able to go wherever you go and that is wonderful! As a funeral director, I think it makes perfect sense to have her cremated. Young families tend to not be completely settled on where they want to spend the rest of their lives. It would kill me to know that I could not be in the same place as my child, let alone city or state if they were in a cemetery. For the very reasons you listed, I think it is the best option for parents who have lost a child. They feel the need to be WITH their child, and that is the only way to make that possible. I still drive by the cemetery where my grandparents are buried and get the chills thinking about them decomposing in the ground. I respect you for discussing this when you had absolutely no obligation to do so. I think about you guys often. My 21 sister died 3 months ago, and as her eldest and closest sister, I had an intimate part in planning her funeral and burial arrangements. We ultimately chose a burial–picking out the coffin was incredibly surreal. I liked the idea of cremation, but there were just too many people that would want to visit her. Now that I’m back home, 5 hours away, I still feel the pull to visit her, but it is just logistically impossible for me. I think you and Mike’s decision was perfect, especially since you don’t have the burden of being afraid to move. So many, many hugs to you. When my cousin’s little boy died unexpectedly at the same age as Maddie, they also chose to cremate him so they could always be with him. As a mother who has also had to make this heart wrenching decision this post makes perfect sense. We did the same thing. She lives in our bedroom beside her beautiful picture. It makes me feel at peace to have her near. I can so relate to your post Heather. When Elizabeth died we had to decide that very day what we were going to do. My first instinct was cremation because I didn’t think I could handle seeing her in a casket. But, my husband didn’t want that, and he gently let me know. A couple of other people who were with us at the time, reminded me that it wasn’t just about me anymore. So within about 90 seconds I made a complete 360 and went the traditional route. And for us, it was the right decision. However, having to walk into that room full of caskets and pick one out was excruciating. What criteria do you use to pick out a casket for a 20-year old daughter? I had no idea. In the end we chose by color and picked a rose/mauve kind of color. Seeing her in that casket for the first time was the most difficult thing ever. I remember just wailing and screaming and time just stood still. It was anguish that came from the deepest part of me. But I could touch her and smooth her hair, and it made me realize in no uncertain terms that she was no longer in that body — it was just a remnant of her previous life. My anguish was like a faucet — once I got it all out, I was able to get through the visitation and converse with people in a civilized manner. Where we would bury her was much easier. My parents live just around the corner from a cemetery. It is calm and peaceful and wooded. We live only two blocks from the cemetery as well. We ended up buying 6 plots that day. Two for my parents, one for my single sister and we bought three. All in a row. I didn’t go along to pick out the plots. My only instructions were to pick something close to the woods and not the road. I drive by that cemetery many times every day and I didn’t want to have to see her headstone every time I did. But now, it’s been almost 8 years and it truly wouldn’t have mattered. We were able to route the funeral procession to drive past our home and my parents home one final time which was a nice tribute. In the end, everyone has to do what feels right for them. Liz’s body is a couple of blocks away, but I feel her spirit with me 24/7 and that’s what brings me the most comfort. I have been raised in a culture (the midwest US) where cremation is rare. I’ve only known of a couple of people who have used it for their loved one. I never really thought about it until your Madeline. We lost our 9 year old dog last November. I know that doesn’t even begin to be a drop in the bucket of losing a child. But, we chose this for our Molly and it was a wonderful experience. Six months ago this morning, right about now to be exact, my mom and I drove Molly to the mortuary an hour away. Without going into a lot of detail, we were able to leave there with her remains that day. Her urn is a simple oak box, the same color as her fur. My dad is an over the road trucker and Molly was his sidekick her entire life. She went right back in the truck with him that afternoon. She eventually stayed home where I slept with her urn in a Vera Bradley purse in my bed. Dad has a new dog, a stray rescued by our vet clinic, who was in the building when Molly passed. Even having a new dog (and my two elderly cats), it has been hard to deal with losing Molly. We are so incredibly glad that we chose cremation. She now sits on my dad’s desk and on the 18th of every month, we burn a candle for her in the little shrine we have for her with photos and a clay paw print. Because of this experience, I want to be cremated now. Cremation is no longer a taboo or a mystery for me. I am glad that you keep Maddie with you. I cannot fathom having to make a decision as difficult as that for one of my daughters. When my Dad died in an accident in August 2005, my Mom and sister and I had to make decisions for him. It was so hard and ultimately we went with what we thought our hearts wanted and chose to have him buried. It’s so hard to go to the cemetery and visit him, even though it is a beautiful and peaceful place, it is still so hard to go there. I miss him so much and I often feel guilt for the 4-5 visits per year that I am able to make. I don’t know if I will live out the rest of my life in Florida and at I often wish we would have thought more about the decison first and went with cremation. It was so hard during those first few days to make decisions with the shock and numbness, so hard to even breathe let alone think clearly. It sounds like you and Mike made a great decision for your family and I love that Maddie will get to move to the new house with you all. I like that. I think this is wonderful and I would probably want the very same things as you. I can tell it is a huge comfort to you to have Maddie with you. I have no words that are adequate but I didn’t want to read not respond. I think of all you often. What an awful decision to have to make. I’m glad you did what felt right to you two and it brought you some peace- and Maddie will be able to come with you to your new home. thank you for sharing such a difficult decision. after reading this i’m sure that would be the right choice for me as well. maddie is going to love her new home. A decision no parent should ever have to make. I’d want my baby with me always, too. I could see myself making this very same decision. Having Maddie there with you seems to give you comfort. I’m glad for that. As exciting as it is to move into your new house soon, I had been wondering how you were feeling/coping with the realization of leaving the apartment that was Maddie’s home. I am sure it will be difficult but I am also sure you find peace and comfort, knowing she will be with you wherever you go. Sad, sad, sad. Many hugs to you. I’ve written this comment about six times already, so I’m giving up. My Grandma passed away two weeks ago and her passing has brought back memories of when my brother passed away. I’m having a hard time putting my thoughts into words. Just know you and your family are always in my thoughts. I’m right there with you, Heather. Picking out my daughter’s coffin was the most horrific experience of my life. I was in a complete daze going through it, so I’m really glad I had my MIL with me to help us decide. I had nightmares for months that we had buried her alive and that she was crying for us but we couldn’t hear her through the ground. Thank goodness you chose something that was right for your family and Madeline. I did move out of state from where my baby is buried, and I don’t get back there often. That is one of my biggest regrets in life. Thank you for this post. I think I need to take a road trip in the near future. Maddie will always be with you wherever you go — that’s how it should be. I’m glad that you will always have Maddie with you and you can take her with you to your new home, even though I know she will forever be a part of your life and will forever have your heart. You should know that Jewish law does not allow any cremation whatsoever, on belief that it can block any possibility of resurrection. Gentle, gentle. There are a lot of parents on here who have had to make this decision when they shouldn’t have. If those parents are Jewish, then they already know this law. Respectfully, maybe discussions of children being blocked from the afterlife aren’t a place to go right now. It isn’t going to help anyone’s heart mend. And Hindus cremate as immediately as possible because they believe to NOT is to trap the soul in a body. You, me, Heather, that dude over there, everyone else – We are all doing the best we can to cope at a horrible time. What an agonizing and heartbreaking decision to have to make, and I’m so glad you made the one that is right for your family. My best friend lost a child 14 years ago and she chose cremation as well. They are a military family and never knew where they would end up. As it turns out, they do live out of state now and I know they remain happy with the choice they made. Creamation sounds so awfull to me. The Thought of buring your soul. I always felt like hell was the reason to burn. But After reading your post I can truly see why you choose cramation. You now have Maddie with you and she can be with you and Mike tell the end. Thanks for the posting this . It give me a different look on Creamation. I just remembered to check, congratulations on your 5th place win. $1000 in furniture will definitely come in handy for your move. Maybe it’s wrong of me, but I’m still hoping some of those other winners don’t qualify for the prize and Heather gets bumped up a notch or two!! I hope the others get disqualified toooo!! No, it’s not bad!! Much love to you. I am so glad that Maddie will be making the move with you. Thank you for sharing all that you do. It keeps it all in perspective for me. I have hot, fat tears over here, at the thought of such a young life ending. Oh Heather. My heart aches for you. You have faced decisions no parent should ever face. I, too, am glad you have Maddie with you as you prepare to move into your new home. Thinking of you in NY. Such a blessing that Maddie will be with you in your new home. It wouldn’t be right any other way. Thank you for writing this Heather. I have often wondered why someone chooses cremation for a loved one. This post makes it so clear. I am glad you chose to keep Maddie with you. This concept seems so surreal to me. I had thankfully never thought about it, but they way you describe it makes so much sense. I’m so happy she can move to your new home with you and that there is peace in that for you. Heather, I think it was so brave and strong of you to write this post. I know you’ll always grieve for your sweet Maddie, but rest assured, she knows you and Mike (and Rigby and Annie, too!) love her. She was a lucky little girl as well as beautiful. I remember these conversations we had that summer. I am still right here to hold those thoughts for you anytime you need. You have just written about the struggle I have nearly every day – visiting my sons’ grave. I did go every day and then every week and now as often as I can. I always thought I would be cremated but when Jake died I was so numb. The Jewish custom is to bury the dead – we followed the Jewish custom. Luckily there was only one size casket for someone so small so we did not have to make any choices. When Sawyer died I knew they should be together – they are each in their own tiny caskets in the same plot. I am haunted by the thoughts of them decomposing. I try hard not to think about it. I so wish that they were home in an urn like Maddie. I will never move too far from the cemetery – unless we move them too (the thought of which makes my stomach turn). I am so happy that Maddie is coming to your new home with you all. Take care, hugs and peace. Love and hugs dear friend. Today I’ve got nothing more than that, no words. I hate that you even have to write this. Live this. I’m so so sorry. I wish your sweet Maddie was here to experience everything first hand. Exact same reason why my husbands urn is in my house. I could have never moved from Sarasota, Florida if I had buried him there. It was what I needed 10 years ago and still feel the same today. I was a young widow with a young child. I needed to feel as though my family was still in tac. Heather, as always thank you for sharing your life & thoughts. You always have a way of making any post about Madeline as beautiful as she is. It was really eye opening how many people responded with similar stories and I want to say how sorry I am to all of you and I hope you can find some kind of comfort in each others posts (as much as I wish none of you had to experience it). Thank you again for sharing Madeline with us. Oh Heather, I admire you and Mike’s ability to have come up with this decision to have Maddie with you. I wish I would have had this frame of mind when my mom died… I *hate* “visiting” her in a cemetary and feel guilty that I don’t do it often enough. I had never thought of this aspect of cremation, I am glad Maddie’s physical remains will be with you in your new home. It must be difficult to leave the place where she lived. Much love and luck coming to you from the east coast. Oh Heather. I’m not quite sure what to say, and I think that’s alright, because sometimes there’s just not much needed to be said. Sometimes there just needs to be pain without words, and (limited) understanding with love. I think in my, (again, limited) way, I understand. I can understand needing them with you. Needing to be able to take them with you, wherever you may go. Peace to you and yours, always. I cannot imagine how difficult the decision must have been for you and Mike but you obviously made the right choice. I too would think having my child nearby and present in whatever form would be preferable than the alternative. While heartbreaking and horribly unfair, you still have a part of her to hold and cherish. To keep. My husband and I have a pact, we will both be cremated and our ashes eventually buried in a place meaningful to us both. Together. my son is still “hanging out” with my uncle. this little remains are in a gaudy teddy bear urn and i can’t bring myself to actually purchase his crypt for his final resting place. She will always be with you in your heart, in your soul and in your memory. And she will live on through all the work you do through MOD and FOM. But I am so glad you get to take her with you physically too. Maddie and Annie are lucky girls to have such amazing parents to love them forever! Just love and best wishes to you all. 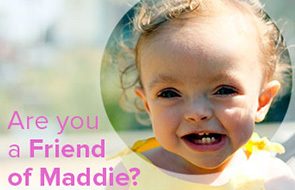 No matter where you live, Maddie always live in your heart. Blessings for your new home. I suspect I would make the same choice if I ever faced that horrible decision. I’m glad Maddie moving with you is bringing you peace of mind. Such a sad post. Really made me think about things I hope I never have to face, yet here you are, having already had to face them. Hugs to you. My heart breaks for you and I don’t even know you. I do believe, however, that the body is just that, a body, a holding cell for the soul. I very much believe in a literal heaven and I very much believe that your beautiful Madeline is there, in a brand new perfect body that will never have anything wrong with it again. I hope that thought brings some comfort to you. I’ve read your blog and followed your story for so long…. starting just before Maddie passed away. And there have been many nights that I’ve woken up in the middle of the night because I couldn’t stop thinking about her (and the pain her absence has caused you and Mike). The tragic loss of such a sweet innocent girl not only changed your lives forever, it affected mine in ways I cannot put into words. I had my first baby, my daughter Piper, almost a year ago (she and Annie would get along so well I think) and I believe I am a better mother because of Maddie. I know how precious my time with her is. It’s so easy to become one of those parents who worries about the things that ultimately don’t matter. When I find myself stressed out or not really in the moment with my daughter I think of Maddie. The memory of her brings me back to what is most important in life. I wish there were some way to bring her back to you or change the events that took her away. No parent should have to make the decision you were forced to make, but it is somewhat comforting to know she is still with you. Thank you for sharing your lives and making us all more appreciative for the amazing gifts in our lives. Thanks so much for sharing this. My son has a neuro-degenerative disorder and will die before his 10th birthday. He is currently four. Although the time for us to make decisions is a long way off I still think about it. I have pretty much settled on cremation and buying a plant in a pot to scatter the ashes around. My husband reckons we should pick a tree in the backyard. I feel that once my son is gone that I might not want to stay here and I want him to come with me wherever I go. Also, I have daughter and I would like her to be able to spend time with her little brother whenever she wants. However, I feel uncomfortable with the idea that my child will be a bunch of ashes. My baby sister was buried in a cemetery in a town where I lived with my family most of my life and we moved away less than a year later. It always bothered me that she had no one to visit her grave. I thought the exact same thing- my husband and I want to eventually move to Utah. I couldn’t imagine burying my son here, and leaving him behind when we moved. At first, my husband always kissed the urn and said our goodnights to him. He doesn’t do it anymore, I think that’s just how he was processing his grief. Now, he sits in our family room with us, always apart of the family. You are so very, sadly, brave. Thank you for describing this for us. It makes it clearer how to support you with love and prayers. Thank you, for this entry. I’m so glad you get to take Maddie with you to the new house. No one should ever have to make this choice, but it sounds like you made exactly the right one for you. When my grandfather died there were many discussions about where his ashes should be scattered although it was always going to be a cremation. My mum and aunt had many suggestions and my nana couldnt decide. In the end I made a suggestion that made so much sense then and even now years later. I suggested that she didnt have to scatter him and she could just keep him at home with her. They had been together forever and she didnt want to be apart from him. So he now resides in his urn, in its box, next to her bed. He’s with her every night, as he was for most of their marriage. We have talked and decided that when nana goes she too will be cremated, and we will mix them together then separate them between the two daughters. And so it will go on. As morbid as it sounds we want our family to stay with us when they’ve gone and to us this seems the best way to do it. And the dogs… well we all have a little collection of boxes that just cant be scattered! Oh honey, once I again I find myself wishing I could reach through the computer to hug you and cry with you and bring you Kleenex. I know you never wanted to be a role model for others in this particular arena, but I hope it brings you comfort in some small fashion that the way you process and share your grieving is helpful to all of us to learn about death, living, and loving. Not even sure what to say but you guys are in my heart. My daughter has Hypoplastic Left Heart Syndrome, a serious heart defect. She is 2 1/2. She is doing very well, but my husband and I try to be realistic about her chances of living a long, long life, which aren’t excellent. The oldest person with her condition is in their late 30’s. We have already talked about what we would do and I agree with each of your points. We’ve already decided we would probably cremate her if we ever lost her. I couldn’t handle not having her with me all the time, even if the idea of cremation bothers me, too. Some people might think it’s weird we’ve already talked about this, but I handle Lauren’s medical condition better when I think about everything that could happen. It’s like I’m preparing for it mentally. You know? Thank you for sharing this. It is exactly what I did with my husband. I know he’s not really there but he’s “with” me and that comforts me beyond belief. . Since then one of his favorite dogs died. She was cremeated as well and her little box is next to his urn. Some day I’m going to a crazy old lady with her collection of loved ones on top of the china cabinet! I can think of worse outcomes. Losing my husband was hard but I can’t imagine the grief you’ve been through and will go through. Anything that comforts you and gives you peace is a blessing. I agree, thank you. The subject was far from me until my grandfather passed away recently.